Festival 2018 is just around the corner and we’re now looking for production support. Help keep our Festival 2018 productions running smoothly during each performance by volunteering for props or wardrobe supervision, or technical operator. If you are a theatre lover and have experience backstage with either props, wardrobe, or lighting operation we have lots of dates available with several shows requiring your support! Props supervision: Be available before, during and after performances. Assist with keeping props organized and in place backstage, and prepare and restock live props (food) and serving containers. Must have previous properties experience. A commitment to an entire production is preferred but ad hoc/show by show support is also welcome. Approx. 4 hrs/day. Wardrobe Supervision: Be available before, during and after performances. On hand backstage in the need of emergency costume maintenance and repairs, sort and reorganize costumes as required pre and post show. Must have previous wardrobe and costume construction experience. Technical Operators – Lighting: Be available before, during and after performances. Lighting board and/or spotlight operator positions available. Previous experience preferred but an aptitude for technical equipment and computers is essential. A commitment to an entire production is preferred. Approx. 4 hrs/day. Roughly 4 hours per performance. You may sign on for as many days as you want. NOTE: high school students may use hours towards required community service contribution. This entry was posted in Latest News, Programs and Events, Volunteer opportunities on June 18, 2018 by redhousecn. Volunteer with us – seeking front of house support for Festival 2018! Festival 2018 is just around the corner and we’re looking for Front of House support. Our front of house volunteers are our front line connection with our patrons on performance days and if you like to support theatre, enjoy promoting local culture and engaging with people, there are several positions available requiring as little as 3 hours of your time. Training is provided and volunteers will have the opportunity to attend dress rehearsals of all productions. Time commitment: Roughly 3 hours per performance. You may sign on for as many days as you want. NOTE: high school students may use hours towards required community service contribution. This entry was posted in Latest News, Programs and Events, Volunteer opportunities on June 7, 2018 by redhousecn. Summer is just around the corner and Theatre on the Ridge has another season of captivating live theatre for all ages at Festival 2018 – from 20th century classics, family favorites, Canadian comedy and drama. Festival 2018 takes place through July and August in Port Perry with 5 productions, an original Lake Scugog themed childrens’ play, a company cabaret and 2 new stories for Pine Grove Plots, the popular theatrical cemetery walk, which debuted in 2017. Festival 2018 has something to keep visitors, and residents in town all summer long! Theatre 3×60 recently changed its name to Theatre on the Ridge, but continues to be Durham’s entertaining and innovative professional theatre company captivating lives on and offstage. Each summer Theatre on the Ridge presents professional theatre and musical productions of new, Canadian and international works that entertain and engage audiences, pairing a quality big city theatre experience with the welcome and appeal of small town rural hospitality. Returning to Theatre on the Ridge this summer are several cast members from past seasons, including Michael Williamson and Lexi McRae (Salt-Water Moon), Duncan Gibson-Lockhart (Mary’s Wedding) and Liam Lynch (Godspell). The company also welcomes several new company members, well known local actors and, for the first time, youth apprentices to the summer roster. The Festival 2018 line up includes The Melville Boys by Norm Foster; Peter Pan by J. M. Barrie – sponsored by Vos’ Indpendent Grocer; The Glass Menagerie by Tennessee Williams; Armstrong’s War by Colleen Murphy; The Drowning Girls by Beth Graham, Charlie Tomlinson, Daniella Vlaskalic; Speakeasy Sunday, a cabaret evening featuring the artists of the company and Monsters & Milfoil, original theatre for young audiences made possible with the support of the Scugog Council for the Arts and the Scugog Lake Stewards. Joining artistic director, Carey Nicholson, director of The Melville Boys, Peter Pan and The Drowning Girls, are Annette Stokes and Michael Serres as co-directors of The Glass Menagerie and Pine Grove Plots, and Duncan Gibson-Lockhart as co-director of Armstrong’s War. Monsters and Milfoil: A Tale of Lake Scugog will be created and directed by members of the company. Full show, cast and ticket information can be found at www.theatreontheridge.ca. Tickets are on sale now at www.townhall1873.ca. This entry was posted in Latest News, Programs and Events, Upcoming Productions on May 17, 2018 by redhousecn. Anyone with a spare bedroom in Port Perry is in for a treat this summer should they decide to host one of the visiting professional actors with Theatre on the Ridge for the upcoming 2018 summer season. Our Festival has actors who will be arriving in Port Perry for an eleven-week period, June 3rd-August 19th. Our goal is to find suitable housing for our summer company members – who come from away to work in Port Perry for the summer! All that is required from a host is a private bedroom for the performer, and access to a kitchen and bathroom. Our summer company members are prepared to pay a nominal weekly living expense, if required, and will provide all of their own food. We even have a quick questionnaire for prospective hosts to match you with the most suitable actor for your home. Even if hosts cannot provide a space for the complete 11 weeks, anyone interested in hosting over a shorter time frame may still welcome. If you are interested in becoming a billeting host, please contact Carey Nicholson at info@theatre3x60.ca to discuss this opportunity more in depth. This entry was posted in Latest News, Programs and Events, Volunteer opportunities on May 13, 2018 by redhousecn. New Programs start April 16th at Theatre on the Ridge! Theatre On The Ridge now has a new rehearsal and program space as it partners with the Utica Memory Hall to create a home base for our theatre education and community performance programs. We are excited to be taking root in Scugog and to be able to offer youth and adult classes in stagecraft, playwriting and production skills, along with regular staged readings and studio scale productions. Check out what’s starting up the week of April 16! Theatre on the Ridge artistic director Carey Nicholson, brings back her popular non-aerobic stretch and conditioning class – Moving Well – on Monday and Friday mornings and Wednesday evenings. It’s a moderate to almost intense class using body weight, gravity and breathing for general conditioning, stress management, repetitive physical stress and injury recovery. Also on Wednesday evenings starting April 18th, immediately following Moving Well, is a drop in Open Improv class led by Durham Improv members, Scott Barnes and Elysabeth Reavell-Roy. Whether you are a beginner or experienced improvisation artist, this relaxed class is the perfect way to have some fun in the middle of a busy week! And starting Tuesday, May 8th , Smart Acts founder Michael Serres and guest instructor Annette Stokes offer a 6 week Introduction to Drama for Adults program. Fun and informal, the program will explore voice and movement to create characters and dramatic storytelling. Theatre on the Ridge is just settling into its new home, so be sure to watch for announcements on the line up for our upcoming Readings on the Ridge evenings, featuring local playwrights, artists and Theatre on the Ridge company members. AND don’t forget to visit us, and artists Linda Virio, Saundra Reiner, Peter Lauricella and Libbie Burns, during the Lake Scugog Studio Tour on May 5 and 6! Full tour details at www.scugogstudiotour.ca. This entry was posted in Latest News, Programs and Events on April 12, 2018 by redhousecn. Join us on the ridge this summer for Festival 2018! Our summer theatre festival, held annually in Port Perry, presents professional theatre and musical productions of new, Canadian and international works that entertain and engage audiences, pairing a quality big city theatre experience with the welcome and appeal of small town rural hospitality. Five mainstage productions, one original childrens’ play, and the return of our popular site-specific theatrical cemetery walk are featured at Durham’s only professional summer theatre festival. Productions take place July and August at Town Hall 1873 – Centre For The Performing Arts and other local venues in picturesque downtown Port Perry, close to the waterfront, restaurants, shopping and accommodations. 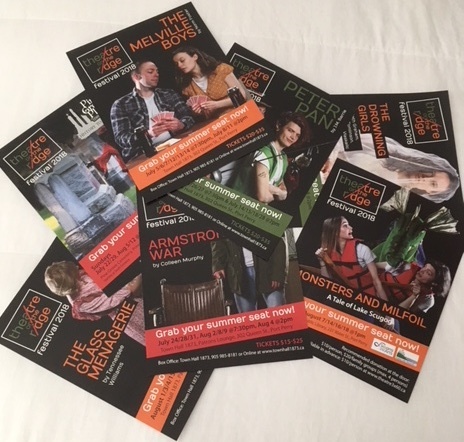 It’s a season filled with something for all ages – from comedy to drama, from heartwarming family stories to fantastic adventures, monsters and residents past! Tickets go on sale April 1 at Town Hall 1873, with ticket prices and packages available for seniors, students, families and groups. Visit us at https://theatre3x60.ca/festival-2018/ to learn more! This entry was posted in Latest News, Programs and Events, Upcoming Productions on March 27, 2018 by redhousecn. Welcome to Our Summer Company Manager! We are very excited to introduce our newest Theatre On The Ridge (formerly Theatre 3×60) team member – Amanda Klein! Amanda is joining us as our Summer Company Manager, through the support of WorkInCulture’s Work Placement program for the Arts and Culture Sector. This program is a full-time, six month contract that allows Amanda to oversee all of our 2018 summer theatre festival productions and events under the mentorship of the company’s Artistic Director and General Manager, Carey Nicholson. Amanda is no stranger to theatre in Durham Region, growing up in Oshawa, having been a member of Oshawa Little Theatre’s Youth Group for several years before graduating from Eastdale Collegiate where she also participated in school productions. Her love of theatre production began while involved as a cast member for two Borelians Community Theatre productions in 2007 and 2009 – Alice In Wonderland and Peter Pan, where she could be found helping stage management with backstage organization between her onstage scenes. 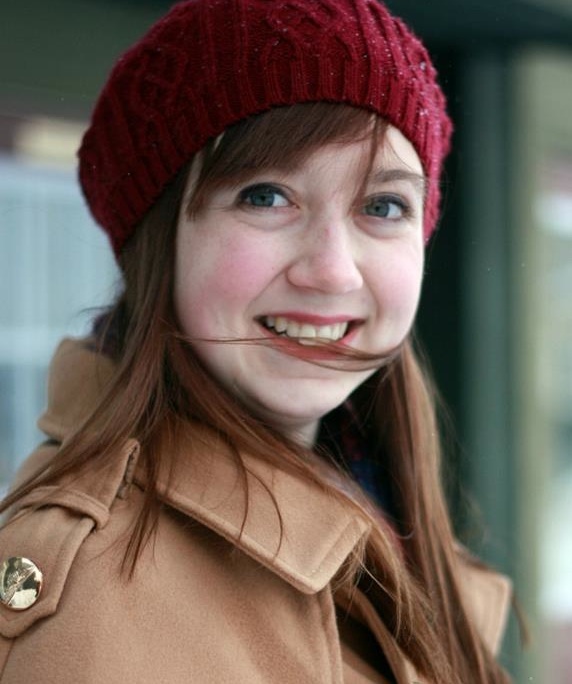 Following high school, Amanda moved out east to pursue technical theatre production at Memorial University of Newfoundland. Since completing her post-secondary education, Amanda has been employed annually at Grandbank Theatre Festival, Gros Morne Theatre Festival and Opera on the Avalon. Watch for upcoming announcements on our Festival 2018 season on Facebook, and sign up for our enewsletter at newsletter@theatre3x60.ca receive all the information on upcoming company events, productions and programs! This entry was posted in Latest News on March 10, 2018 by redhousecn.